How to increase internet speed: effective tricks – Nowadays, everyone seems to be in hurry. Everyone wants quick access to everything. Slow internet always frustrate everyone. Internet has become a part and parcel of our life. Every task, today, is done through internet. Be it paying bills, filling forms, shopping, booking tickets or even finding your life partner…. internet is used everywhere. But sometimes slow internet disappoints you often. 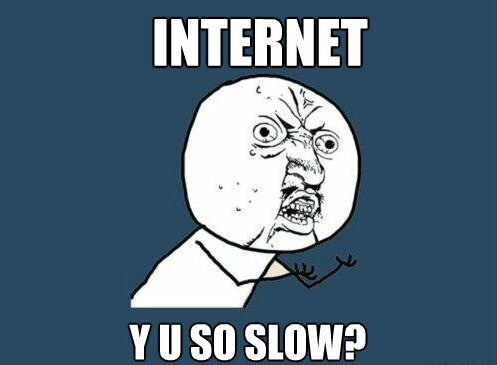 Slow internet often disrupts our daily activities. So, to prevent these disruptions, I would share some tricks with you. These tricks will increase internet speed. Though, these tricks to increase internet speed would not make your internet speed super fast but just improve it from before. Low Bandwidth of your spectrum. Loose wire connection in case of Broadband. Interference of signals in case of wireless connection. Slow network in your area. Increased disk space of your temporary files and cache files. 1. Click on “start” on your taskbar and click run option (shortcut key – windows button + R). 2. Type gpedit.msc and press enter. It will open a window of “Local group Policy”. 4. Click on Limit Reservable Bandwidth. It will open a new window. 5. By default, “not configured” option will be selected. An operating system reserves 20% for its updation process. 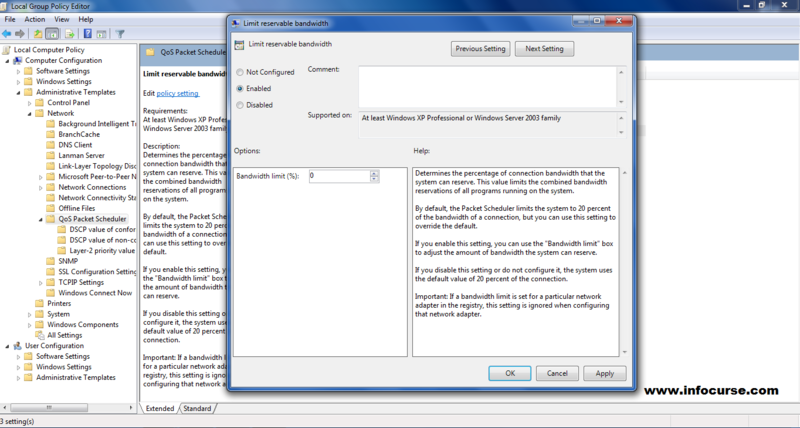 Click on “enable” option and set bandwidth limit (%) to 0. Now, you will get the entire speed for your surfing. You can use open DNS in order to increase internet speed on Windows. There are several advantage also in using Open DNS. It protects your IP address from hacking attacks and infections. But you need to update this process in a week. – “Network sharing center” or “View network status”. – Search for network connection. – Search for Internet protocol Version 4 (TCP/IPv4). – Click on properties once again. 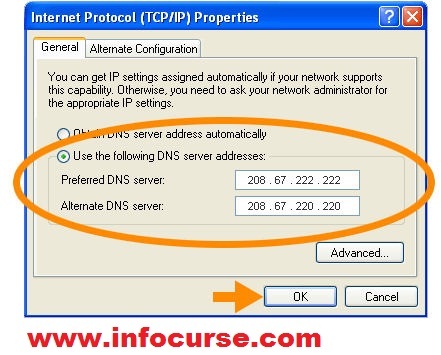 – Enter 208.67.222.222 in “preferred DNS server” and 208.67.222.220 in “Alternate DNS server”. – Now, exit the window bar. 2. Now, press windows button + R.
3. Type ipconfig/flushdns in the “Run” windows. The method of Open DNS is now configured and completed. 1. Go to “Run” command and then type “temp”. A temp folder will appear in your screen. (without quotes). 2. Select all files (shortcut key – ctrl + A). 4. Now, go to “Run” command again and type “%temp%” and press enter. 5. Select all files and delete it. 6. Again go to “Run” command and type “netsh winsock reset”. A windows comes and goes. 7. Open “Run” command again, type “netsh int ip resetlog.txt”. Again a windows comes and goes. 8. Then go to your web browser, click on tools-Internet option-delete cookies and files. Press OK.
9. Restart your system manually. Then enable your antivirus program. 10. Now, Check your download and upload speed by following this link. Next articleTrick: Convert SD card to increase ram of your android smartphone/tablet.